"I found the book very concise, condensed, yet containing adequate information on the history of Arizona, to allow the reader to have a full knowledge of whatever interested him." 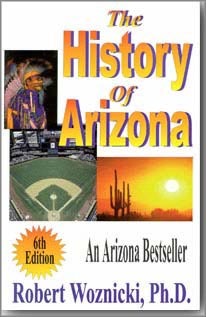 "The book can teach both visitors and residents a lot about Arizona. The book deserves a place on every home bookshelf." One of the oldest cities in the United States is the small village of Oraibi, Arizona, located in Navajo County near the city of Winslow. It is believed to have been in existence since the fourteenth century. Once the largest of the Hopi towns, its population of 800 at the turn of the century was reduced to about half in 1907, when many of the people left to found the village of Hotevilla, seven miles west. 1. No smoking or use of spirits. 2. Marriage or other unseemly behavior was not to be tolerated. 3. Joining of any feminist movement, such as the Suffragettes, was forbidden. 1. Women may not dye their hair. 2. Two petticoats must be worn. 3. You are not to keep company with men. 5. Dresses must be two inches above the ankle. 6. You may not dress in bright colors. Whoever heard of Arizona having a navy? Well, it did. In 1934 California utility companies were battling Arizona for water rights to the Colorado River. Governor Moeur of Arizona at that time sent two patrol boats, the Julia B and the Nellie T, to cruise the Colorado River to make sure that all would be aware that Arizona was determined to protect her rights. As it turned out, the two boats and members of the national guard got tangled in weeds and cable, and had to be towed by their adversaries. Arizona's navy was disgraced. Copyright © 1999 by Robert Woznicki.